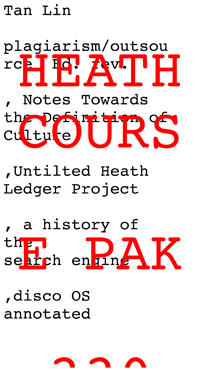 In HEATH COURSE PAK Tan Lin continues his exploration of the ambient novel, focusing on the idea of how a book works and how a reader reacts to a book (literally a printed object) when its content bears no direct progression from A to B and instead offers tangential and obliquely-linked plagiarisms, outsourced ephemera, and meta-content. Without a vague curiousity towards the book as an object, and how the book as an object works, there is little of interest here–this is a mass-produced artists’ book, battling with the world of conceptualism, occasionally tittering into poetry via the banality of its content (this is not surprisingly as Lin himself ‘began,’ shall we say, as a slightly-more straight-forward poet). It’s certainly interesting in theory, but in practice there’s no way to avoid the fact that reading the book, in the way one reads a traditional novel, is boring. But, perhaps that’s a moot point. Lin’s intent seems to be related to, as he explains in an interview both in the book and in interviews various places over the internet, an interest in developing an ambient novel, in the way that Eno accidentally created an entire genre of music by releasing Music for Airports (though this in itself is also an arguable point, it draws an interesting point of comparison– Eno’s ambience still carried a significantly melodic mode, perhaps we could insist that ‘melody’ in music is ‘narrative’ in The Book–there is no melody in Tan Lin’s work, unless we stretch the metaphor to extend towards serial music, perhaps we can find something). The book is interesting in that it’s specifically not interesting, it’s successful because of the way it fails, it succeeds so adequetely at what it sets out to do that as a book it becomes a mere chore, an exercise. But the stamina required is beautiful, and Lin’s trajectory through the world of literature, as an outlier questioning things completely different than anybody else, is entirely necessary.